For the sunchoke sauce, peel sunchokes and celery root. Roughly dice celeriac and sunchokes. Transfer to a small saucepan. Add soy milk and let simmer for approx. 30 min. on the side. In two separate saucepans, each with a bamboo steamer on top, bring water to a boil. Prepare baby red peppers, baby zucchinis, baby corns, shiitake mushrooms, baby carrots, baby bok choy, baby fennel, and green asparagus. Add all vegetables to the bamboo steamers and steam for approx. 12 min. When the celery root and sunchokes are tender, remove them from heat. Transfer to a blender and pulse until smooth. Strain the sunchoke sauce through a sieve, using a whisk. Season to taste with lemon juice. Season with salt and pepper, if desired. 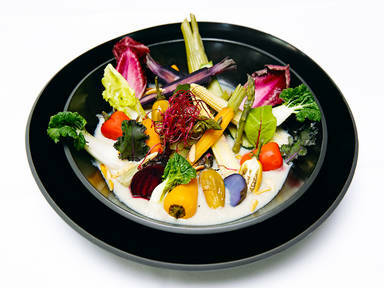 Distribute sunchoke sauce on serving plates and serve steamed vegetables, endive and radicchio leaves on top. Garnish with red beet sprouts, slivered almonds, and flaky sea salt. Enjoy!